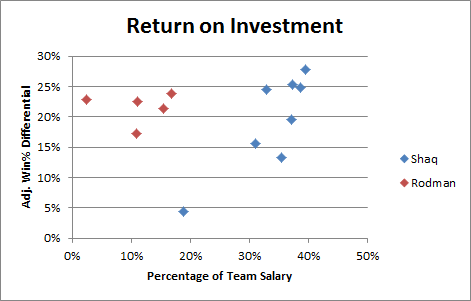 In any salary-capped sport, the key to building a championship contender is to maximize surplus value by underpaying your team as much as possible. The NBA is dominated by a handful of super-star players who get paid the same amount as regular-star players. Thus, the easiest way to get massive surplus value in the NBA is to get one or more of those players on your team, by any means necessary. 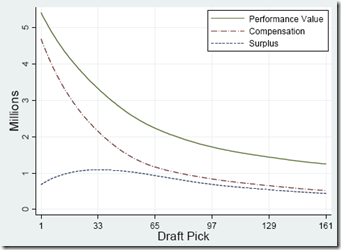 Not only is the draft a great place to find potentially great players, but because of the ridiculously low rookie pay scale, your benefit to finding one is even greater. Superstars don’t grown on trees, and drafting #1 ensures you will get the player that you believe is most likely to become one. 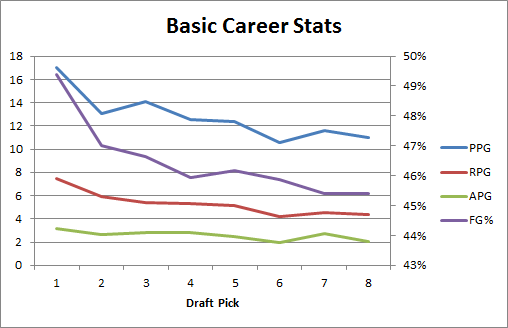 I could leave it at that, as it’s almost necessarily true that drafting #1 will improve your chances. But I suppose what people really want to know is how much does it “up your odds”? To answer that, we also need to look at the empirical question of how valuable the “most likely to be a superstar” actually is. So, a few extra points (or WPA’s, or WoW’s, or whatevers) here or there, what about championships? 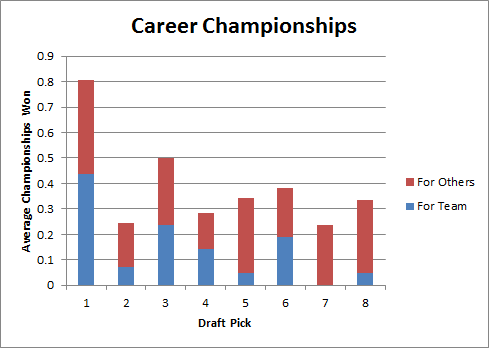 And, specifically, what about championships a player wins for his drafting team? 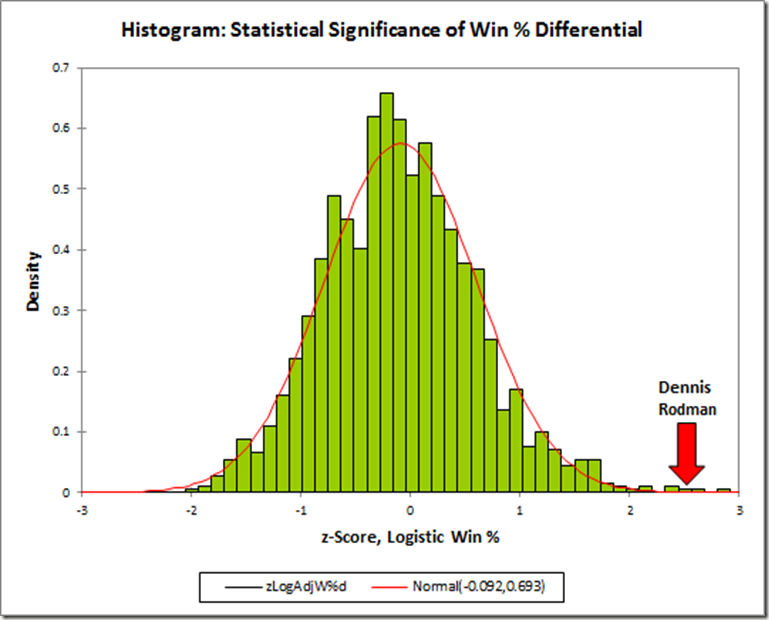 The many histograms in sections (a)-(c) of Part 3 reflect fantastic p-values (probability that the outcome occurred by chance) for Dennis Rodman’s win percentage differentials relative to other players, but, technically, this doesn’t say anything about the p-values of each metric in itself. 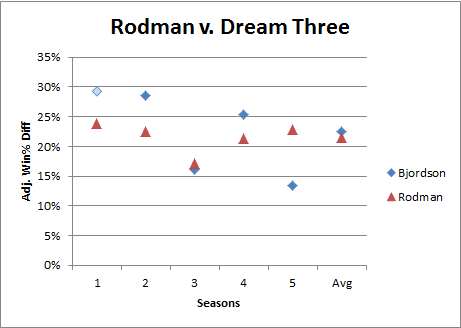 What this means is, while we have confidently established that Rodman’s didn’t just get lucky in putting up better numbers than his peers, we haven’t yet established the extent to which his being one of the best players by this measure actually proves his value. This is probably a minor distinction to all but my most nitpicky readers, but it is exactly one of those nagging “little insignificant details” that ends up being a key to the entire mystery. The challenge here is this: My preferred method for rating the usefulness and reliability of various statistics is to see how accurate they are at predicting win differentials. 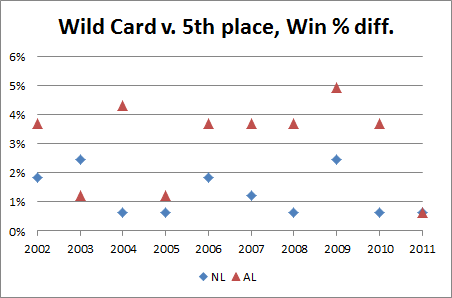 But, now, the statistic I would like to test actually is win differential. The problem, of course, is that a player’s win differential is always going to be exactly identical to his win differential. If you’re familiar with the halting problem or Gödel’s incompleteness theorem, you probably know that this probably isn’t directly solvable: that is, I probably can’t design a metric for evaluating metrics that is capable of evaluating itself. 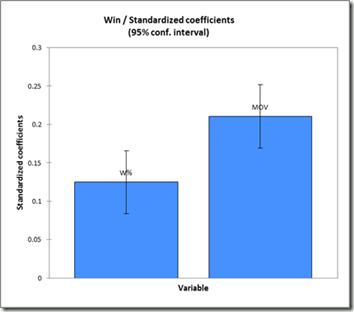 To work around this, our first step must be to independently assess the reliability of win predictions that are based on our inputs. As in sections (b) and (c), we should be able to do this on a team-by-team basis and adapt the results for player-by-player use. Specifically, what we need to know is the error distribution for the outcome-predicting equation—but this raises its own problems. 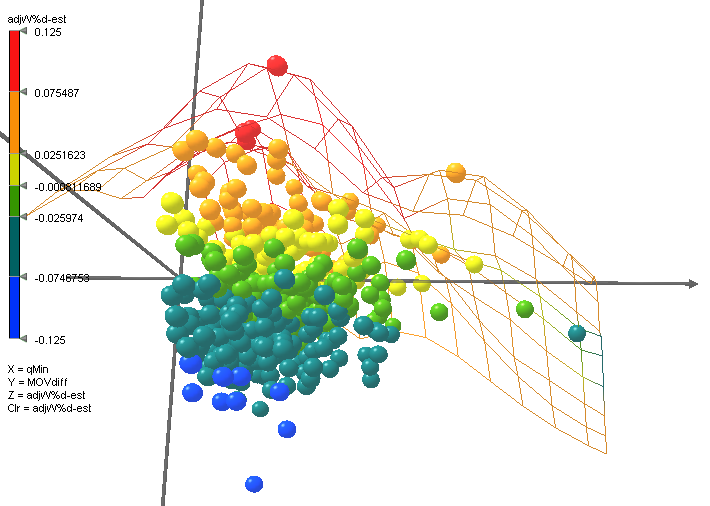 Normally, to get an error distribution of a predictive model, you just run the model a bunch of times and then measure the predicted results versus the actual results (calculating your average error, standard deviation, correlation, whatever). 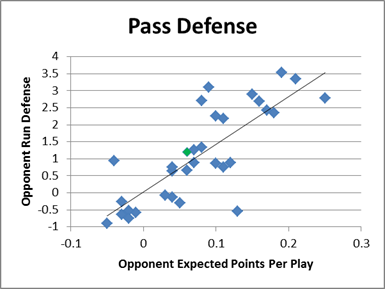 But, because my regression was to individual games, the error distribution gets “black-boxed” into the single-game win probability. For our purposes, what this means is that we need to choose something else to predict: specifically, something that will have an accurate and measurable error distribution. 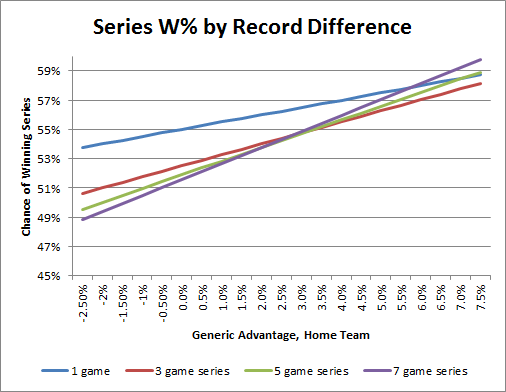 Thus, instead of using data from 81 games to predict the probability of winning one game, I decided to use data from 41 season-games to predict a team’s winning percentage in its other 41 games. To do this, I split every team season since 1986 in half randomly, 10 times each, leading to a dataset of 6000ish randomly-generated half-season pairs. I then ran a logistic regression from each half to the other, using team winning percentage and team margin of victory as the input variables and games won as the output variable. 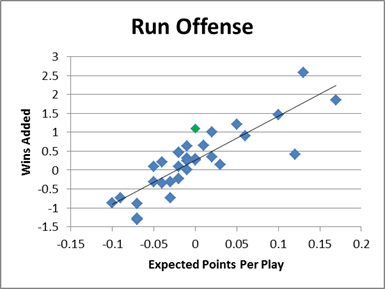 I then measured the distribution of those outcomes, which gives us a baseline standard deviation for our predicted wins metric for a 41 game sample. Next, as I discussed briefly in section (b), we can adapt the distribution to other sample sizes, so long as everything is distributed normally (which, at every point in the way so far, it has been). 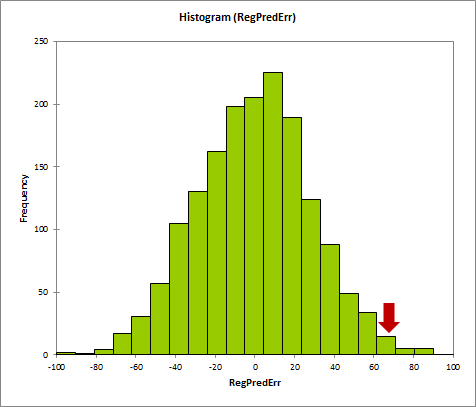 This is a feature of the normal distribution: it is easy to predict the error distribution of larger and smaller datasets—your standard deviation will be directly proportional to the square-root of the ratio of the new sample size to the original sample size. 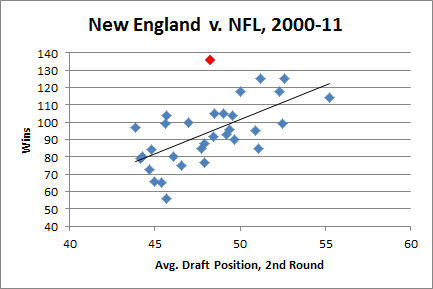 This gives us a standard deviation for actual vs. predicted winning percentages for any sample size. Whew! The good news is: now that we can generate standard deviations for each player’s win differentials, this allows us to calculate p-values for each metric, which allows us to finally address the big questions head on: How likely is it that this player’s performance was due to chance? 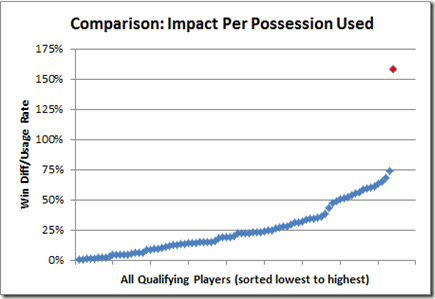 Or, put another way: How much evidence is there that this player had a significant impact on winning? The better news is: since our standard deviations are adjusted for sample size, we can greatly increase the size of the comparison pool, because players with smaller samples are “punished” accordingly. Thus, I dropped the 3-season requirement and the total minutes requirement entirely. 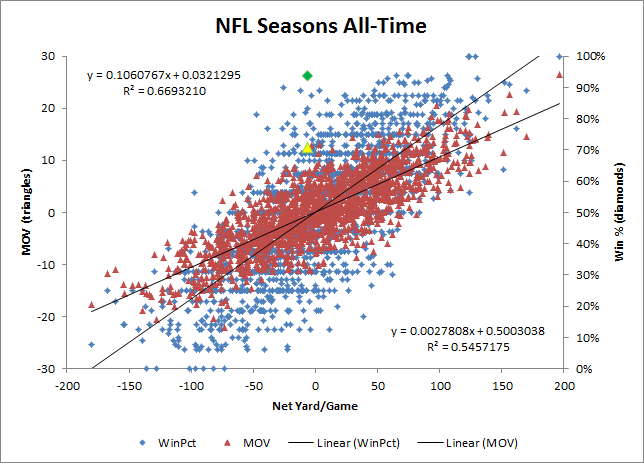 The only remaining filters are that the player missed at least 15 games for each season in which a differential is computed, and that the player averaged at least 15 minutes per game played in those seasons. The new dataset now includes 1539 players. 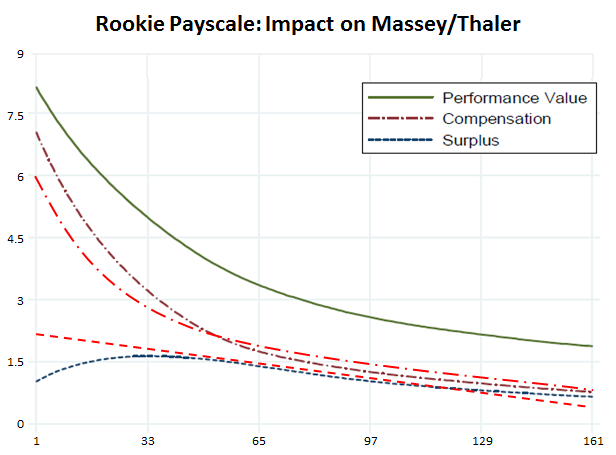 Normally I don’t weight individual qualifying seasons when computing career differentials for qualifying players, because the weights are an evidentiary matter rather than an impact matter: when it comes to estimating a player’s impact, conceptually I think a player’s effect on team performance should be averaged across circumstances equally. But this comparison isn’t about whose stats indicate the most skill, but whose stats make for the best evidence of positive contribution. 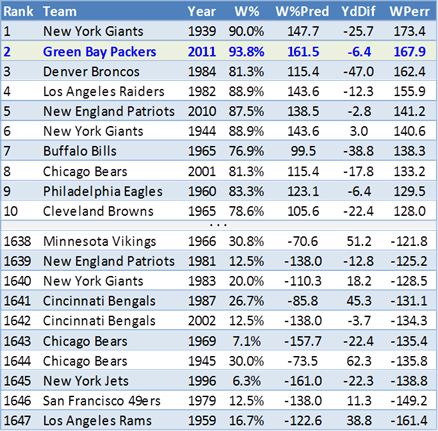 Thus, I’ve weighted each season (by the smaller of games missed or played) before making the relevant calculations. 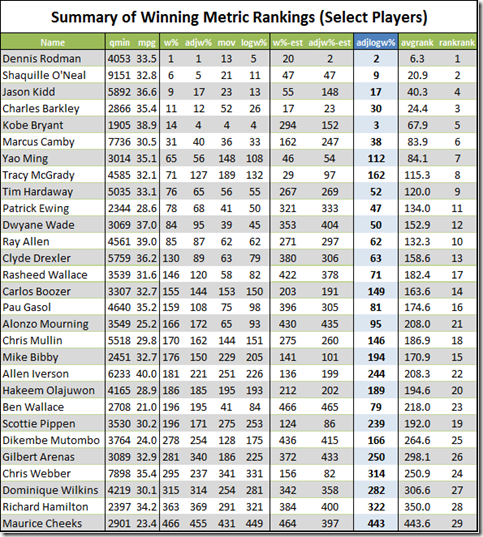 Note: I’ve posted a complete table of z scores and p values for all 1539 players on the site. Note also that due to the weighting, some of the individual differential stats will be slightly different from their previous values. You should be careful to understand the difference between this table of p-values and ranks vs. similar ones from earlier sections. In those tables, the p-value was determined by Rodman’s relative position in the pool, so the p-value and rank basically represented the same thing. 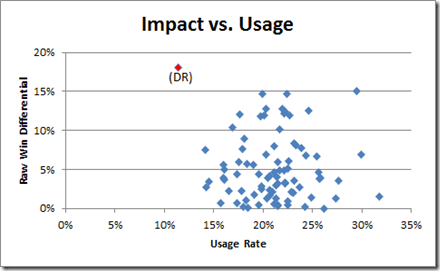 In this case, the p-value is based on the expected error in the results. 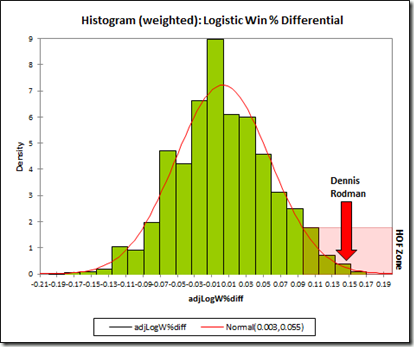 Specifically, they are the answer to the question “If Dennis Rodman actually had zero impact, how likely would it be for him to have posted these differentials over a sample of this size?” The “rank” is then where his answer ranks among the answers to the same question for the other 1538 players. 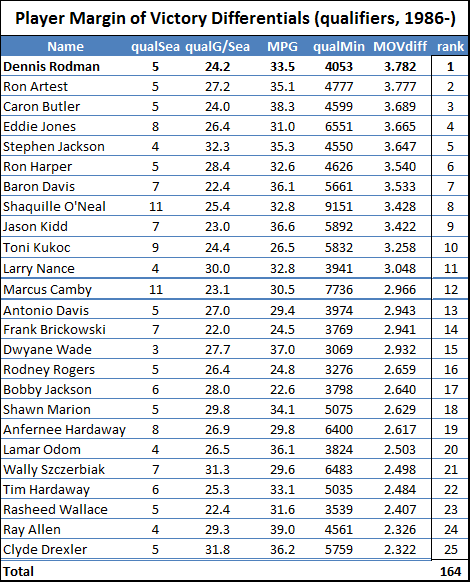 Depending on your favorite flavor of win differential, Rodman ranks anywhere from 1st to 8th. His average rank among those is 3.5, which is 2nd only to Shaquille O’Neal (whose differentials are smaller but whose sample is much larger). Now, to be completely clear, as I addressed in Part 3(a) and 2(b), so that I don’t get flamed (or stabbed, poisoned, shot, beaten, shot again, mutilated, drowned, and burned—metaphorically): Yes, actually I AM saying that, when it comes to empirical evidence based on win differentials, Rodman IS superior to Michael Jordan. This doesn’t mean he was the better player: for that, we can speculate, watch the tape, or analyze other sources of statistical evidence all day long. 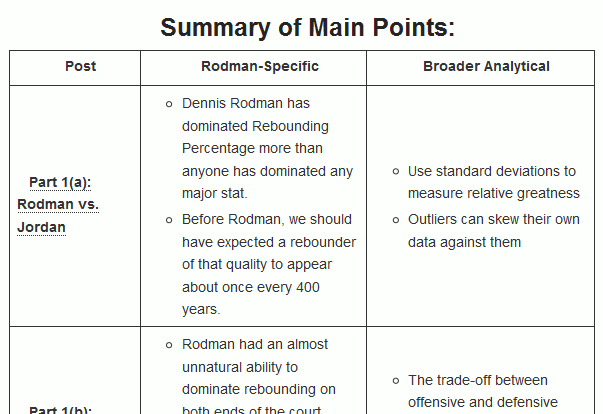 But for this source of information, in the final reckoning, win differentials provide more evidence of Dennis Rodman’s value than they do of Michael Jordan’s. The best news is: That’s it. This is game, set, and match. 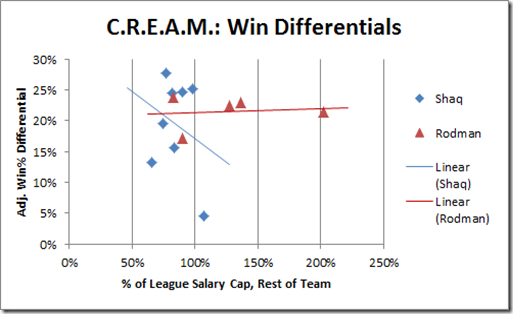 If the 5 championships, the ridiculous rebounding stats, the deconstructed margin of victory, etc., aren’t enough to convince you, this should be: Looking at Win% and MOV differentials over the past 25 years, when we examine which players have the strongest, most reliable evidence that they were substantial contributors to their teams’ ability to win more basketball games, Dennis Rodman is among the tiny handful of players at the very very top. The sports analytical community has long used Margin of Victory or similar metrics as their core component for predicting future outcomes. 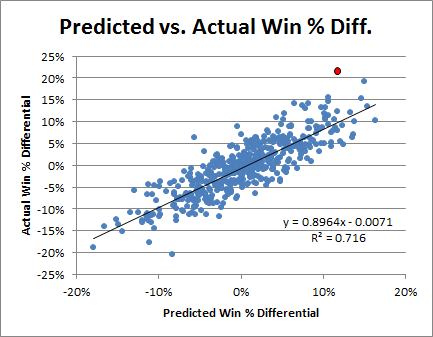 In situations with relatively small samples, it generally slightly outperforms win percentages, even when predicting win percentages. Note: e is euler’s number, or ~2.72. 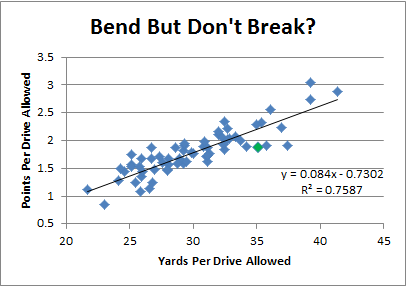 mv is the variable for margin of victory. So, for example, if a team’s point differential (MOV) over 81 games is 3.78 points per game, their odds of winning their 82nd game would be 61.7%. 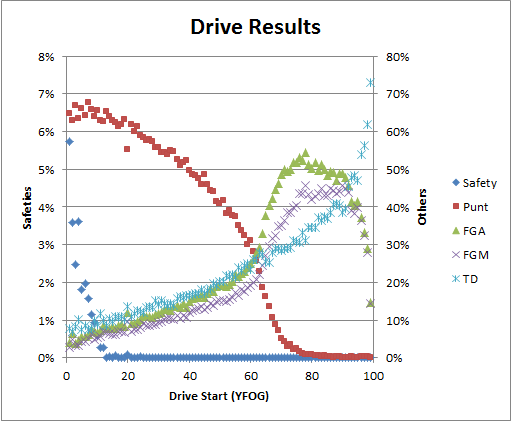 Of course, we can use this same formula to predict a player’s win% differential based on his MOV differential. 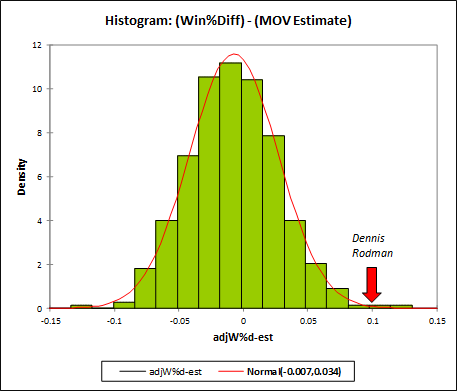 If, based on his MOV contribution alone, a player’s team would be expected to win 61.7% of the time, then his predicted win% differential is what his contribution would be above average, in this case 11.7% (this is one reason why, for comparison purposes, I prefer to use adjusted win differentials, as discussed in Part 3(a)). It can be hard to see where a point stands in space in a 2-D image, but I’ve added a surface grid to try to help guide you: the red point on top of the red mountain is Dennis Rodman. No man is an island. Except, apparently, for Dennis Rodman. 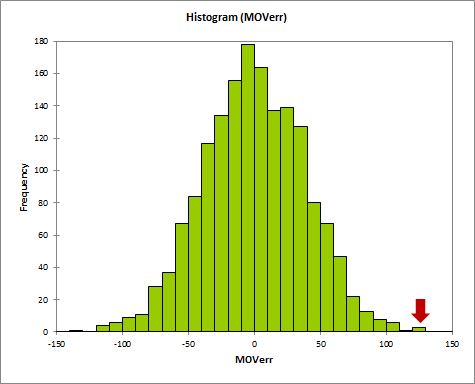 Note that he is about 4 standard deviations above the mean (and observe how the normal distribution line has actually blended with the axis below his data point). Where does Rodman’s X-Factor come from? 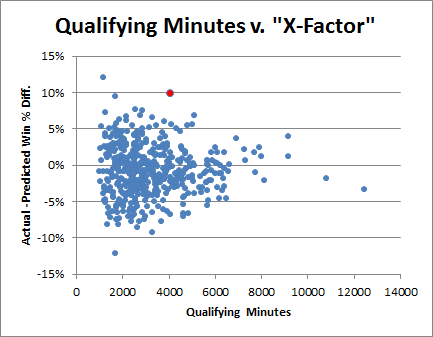 Strictly speaking, what I’m calling “X-Factor” is just the prediction error of this model with respect to players. Some of that error is random and some of it is systematic. In section (c), I will prove that it’s not entirely random, though where it comes from for any individual player, I can only speculate. 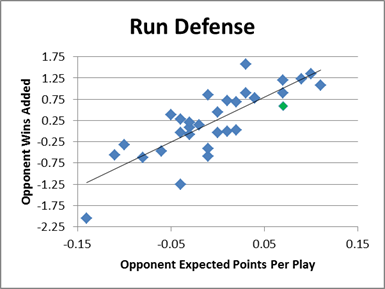 Margin of Victory treats all contributions to a game’s point spread equally, whether they came at the tail end of a blowout, or in the final seconds of squeaker. One thing that could contribute to a high X-factor is “clutch”ness. A “clutch” shooter (like a Robert Horry), for example, might be an average or even slightly below-average player for most of the time he is on the floor, but an extremely valuable one near the end of games that could go either way. 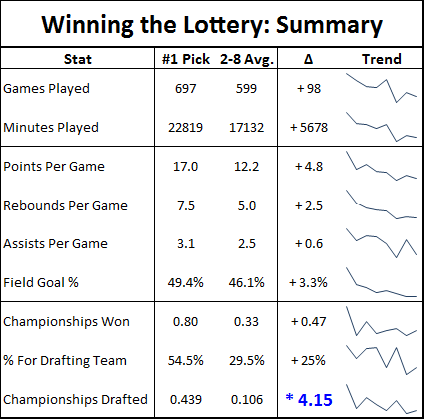 The net effect from the non-close games would be small for both metrics, but the effect of winning close games would be much higher on Win% than MOV. Of course, “clutch”ness doesn’t have to be limited to shooters: e.g., if one of a particular player’s skill advantages over the competition is that he makes better tactical decisions near the end of close games (like knowing when to intentionally foul, etc. 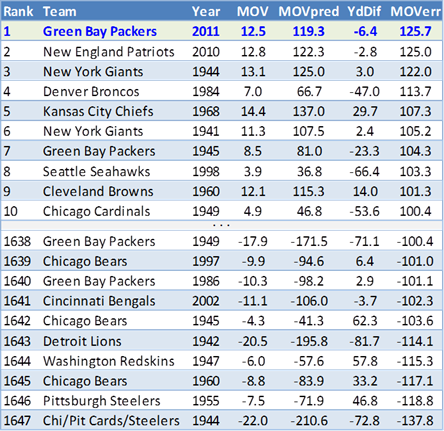 ), that would reflect much more strongly in his W% than in his MOV. Also, a player who contributes significantly whenever they are on the floor but is frequently taken out of non-close games as a precaution again fatigue or injury may have a Win % that accurately reflects his impact, but a significantly understated MOV. E.g., in the Boston Celtics “Big 3” championship season, Kevin Garnett was rested constantly—a fact that probably killed his chances of being that season’s MVP—yet the Celtics won by far the most games in the league. In this case, the player is “clutch” just by virtue of being on the floor more in clutch spots. The converse possibility also exists: A player could be “reverse clutch,” meaning that he plays worse when the game is NOT on the line. This would ultimately have the same statistical effect as if he played better in crunch time. And indeed, based on completely non-rigorous and anecdotal speculation, I think this is a possible factor in Rodman’s case. During his time in Chicago, I definitely recall him doing a number of silly things in the 4th quarter of blowout games (like launching up ridiculous 3-pointers) when it didn’t matter—and in a game of small margins, these things add up. 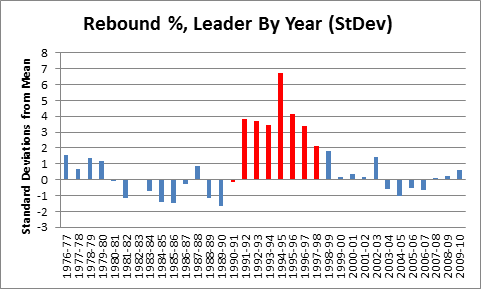 Finally, though it cuts a small amount against the absurdity of Rodman’s rebounding statistics, I would be derelict as an analyst not to mention the possibility that Rodman may have played sub-optimally in non-close games in order to pad his rebounding numbers. The net effect, of course, would be that his rebounding statistics could be slightly overstated, while his value (which is already quite prodigious) could be substantially understated. To be completely honest, with his rebounding percentages and his X-Factor both being such extreme outliers, I have to think that at least some relationship existing between the two is likely. If you’re emotionally attached to the freak-alien-rebounder hypothesis, this might seem to be a bad result for you. 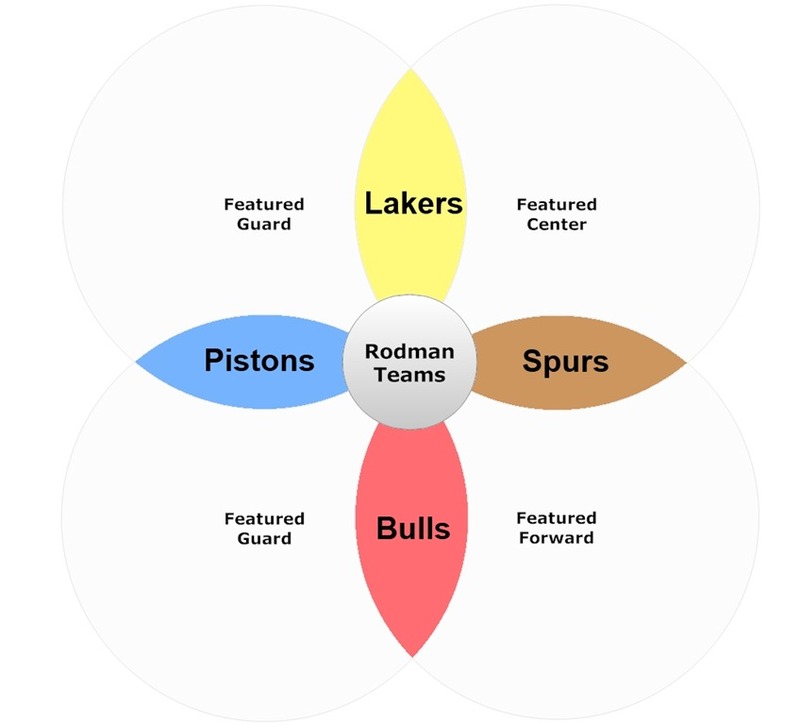 But if you’re interested in Rodman’s true value to the teams he played for, you should understand that, if this theory is accurate, it could put Rodman’s true impact on winning into the stratosphere. That is, this possibility gives no fuel to Rodman’s potential critics: the worst cases on either side of the spectrum are that Rodman was the sickest rebounder with a great impact on his teams, or that he was a great rebounder with the sickest impact. 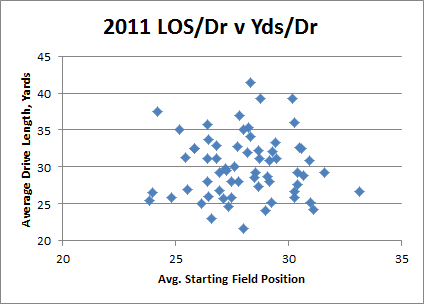 In the next section, I will be examining the relative reliability and importance of Margin of Victory vs. 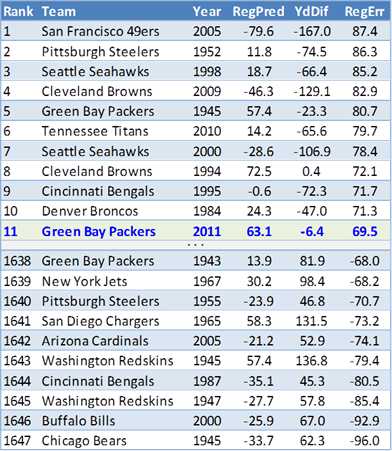 Win % generally, across the entire league. 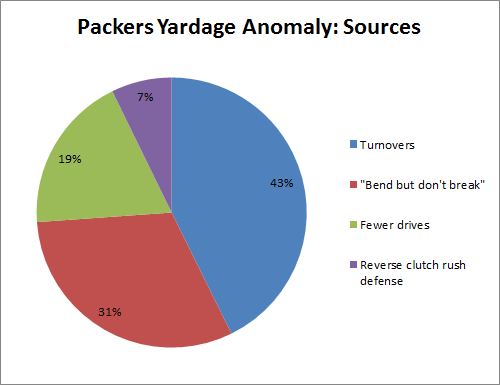 In my “endgame” analysis, this is the balance of factors that I will use. 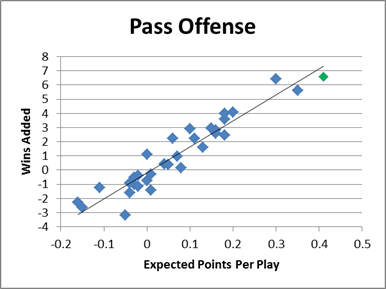 But the league patterns do not necessarily apply in all situations: In some cases, a player’s X-factor may be all luck, in some cases it may be all skill, and in most it is probably a mixture of both. 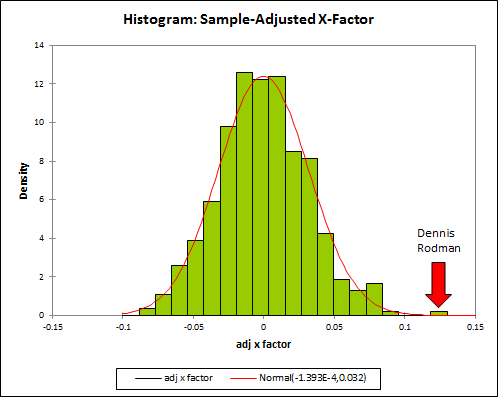 So, for example, if my speculation about Rodman’s X-Factor were true, my final analysis of Rodman’s value could be greatly understated.